Monique is 28 has been thru so much in her young life. 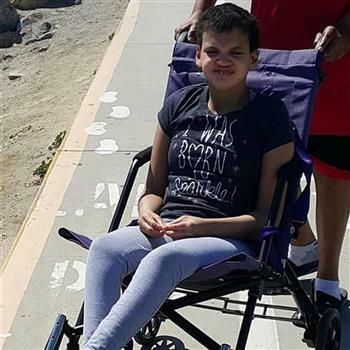 Server Autism, CP, Mental and physical disabilities, a stroke (age 10), meningitis, brain surgeries and so on.. She needs this bike, so she could enjoy family outings. We would love to take her out on bike rides plus it would get ALL of us out the house as a family, instead of staying home. She likes car rides but to get her out on a bike ride in the sun, enjoying the day, will not only help her but get us some exercise as well. She has gotten to use to staying home (comfort zone), hoping this will help with socialization and her anxiety. This would add to her quality of life. Also Please Share with your friends to vote The more the merrier. THANK YOU Donations are always welcome. Monique is 28 server autism, CP, mental and physical disabilities, needs this bike, so she could enjoy family outings. We would love to take her out on bike rides plus it would get ALL of us out the house as a family, instead of staying home. She likes car rides but to get her out on a bike ride in the sun, enjoying the day, will not only help her but get us some exercise as well. She has gotten to use to staying home (comfort zone), hoping this will help with socialization and her anxiety.